Vegetated Roofs and Stormwater - American Hydrotech, Inc.
Green roofs – also known as vegetated or garden roofs – are key green infrastructure elements and are being increasingly recognized for their “valuable ability to absorb, reduce, and delay stormwater from reaching sewers or other grey infrastructure systems,” says Richard Hayden, garden roof product manager with Chicago-based American Hydrotech. 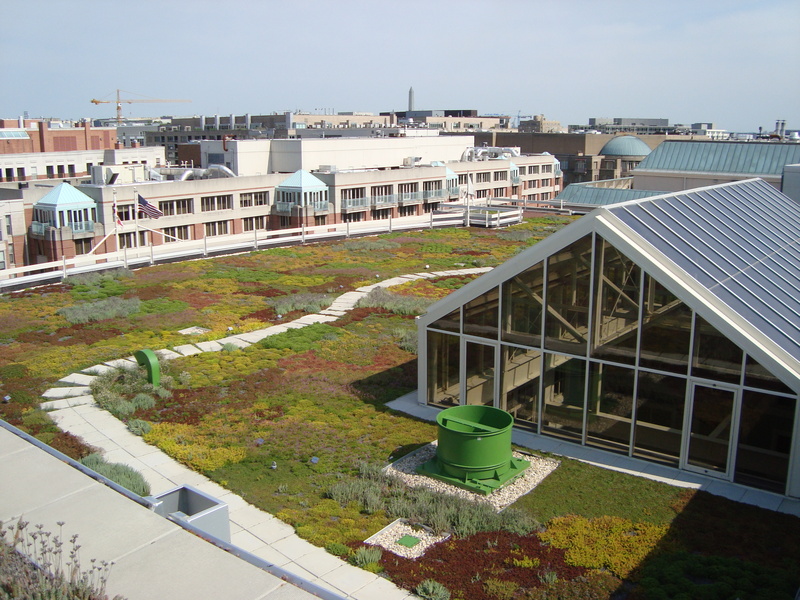 Green roofs work by storing rainwater in several areas of a layered assembly: in open pore spaces of the growing media and within the drainage and water retention system that underlies the growing media and plantings. The rainwater is retained until the assembly is completely saturated, and excess water is slowly released from the roof into the site’s stormwater system. Stormwater runoff volume also is reduced because of evapotranspiration, which cools the surrounding air. What started off as an effort to add green space on buildings for purely aesthetic purposes has morphed in a very important BMP option for handling rainwater at the point where it lands on the roof, Hayden points out. American Hydrotech manufactures and supplies waterproofing and roofing components for projects worldwide. Its flagship product is the original hot, fluid-applied rubberized asphalt, Monolithic Membrane 6125. Originally developed in the 1960s as a waterproofing element for bridge structures in Canada, MM6125 is now used for creating green roofs. Its seamless application makes it impervious to the effects of the wet conditions that are typical of green roofs, says Hayden. In 1996, Hydrotech introduced the Garden Roof Assembly and has since supplied waterproofing, drainage materials, lightweight growing media, and plants for more than 2,000 projects in the US and Canada.